Priscilla Sutton’s exhibition, Spare Parts, is about more than prosthetics. It’s about a better way of life. 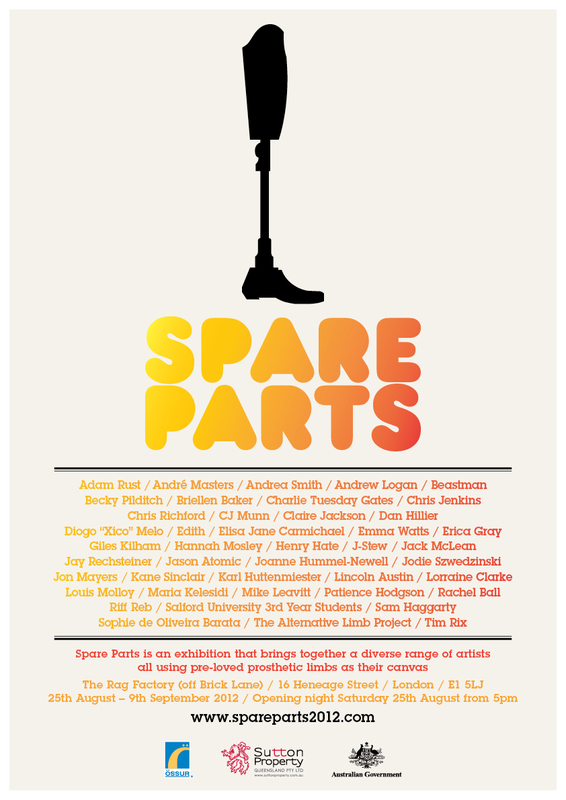 Spare Parts, an exhibition of prosthetic limbs that have been transformed into works of art, was hosted at The Rag Factory in London from Aug. 25 to Sept. 9 to coincide with the Paralympic Games, which was a dream come true for the curator, Priscilla Sutton. 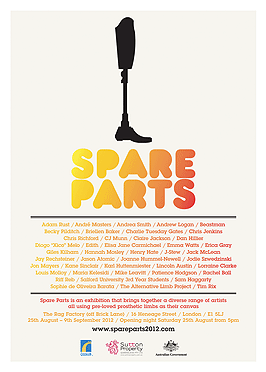 The idea for the Spare Parts exhibition came to Sutton in 2010, when she cleaned out a cupboard and found several old prosthetic legs gathering dust. 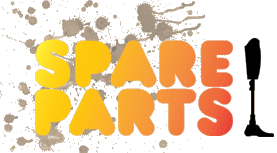 The first Spare Parts art exhibition was held in Brisbane from November 2010 to December 2010. Sutton did not expect to put together another exhibition. However, when encouraged to look into hosting an exhibit during the Paralympic Games in London, she took on the challenge. Reaching out through social media websites, hospitals, private prosthetic clinics and support groups, Sutton found plenty of amputees willing to donate spare limbs to the exhibit. Opening just before the Paralympics, the Spare Parts exhibition ran for 2 weeks, closing the same day the Paralympics ended. Sutton was born in Biloela — a small country town in Queensland, Australia — without a fibula, which resulted in a shortened leg with bundled toes. When doctors talked about amputation after she was born, her mother decided to let Sutton choose for herself whether to amputate or not when she was older. The decision to amputate came in November of 2005 when Sutton was in her mid-20s. After the surgery, Sutton has been able to lead a happy and healthy lifestyle. She works at Queensland Health in Australia in the mental health department and enjoys exercise and travel. Some of her favorite activities include boxing, running and going to the golf range. While Sutton finds the technology behind the mechanics of prosthetics to be fascinating, she also finds the technology for the cosmetics fascinating as well. Her own prosthetics are decorated with art that expresses her personality. Sutton explained that she learned that a lot of people who lose an arm do not use a prosthetic because they find them to be dead weight.